Wholesale Hand towels Light Blue in premium extra soft quality. Made of 100% cotton popular with hair salons, nail salons, gyms, schools, sports teams. Durable and long lasting. 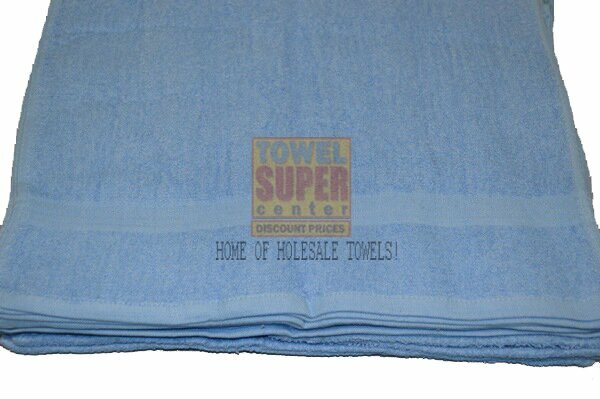 Are you in the market for premium light blue hand towels at a true wholesale cost? Towel Super Center has exactly what you need! Our 16" by 27" towels are constructed of 100-percent cotton and are ready to add vibrancy and performance to any space in your home or workplace. Place your order online and get deeper discounts the more towels you purchase. Stock up and save on all the premium towels you need. Have you ever wondered what makes a light blue hand towel so appealing in almost any bath area or other living or working space? The answer is that light blue tends to do with almost any interior design. For instance, if your tastes lean more toward contemporary shades such as brown, black, white or silver, light blue hand towels are the ideal complement to neutrals. On the other hand, if you're going for a country look in your bathroom or guest bath location, you'll find that light blue hand towels easily fit right in. Enjoy the versatility and attractiveness of a light blue wholesale-priced hand towel today! Where Could You Use a Wholesale Hand Towel? It might surprise you to learn that there are plenty of places that a wholesale cotton hand towel in light blue can be a lifesaver! Bathrooms. Nothing is as frustrating as not having a hand towel to use. Make sure everyone who enters your home bathroom or uses your private office bathroom can enjoy a high degree of pampering by supplying light blue hand towels. Kitchens. In addition to typical kitchen dishtowels, many families like to have hand towels available in the kitchen. Hand towels made of 100-percent cotton are often softer on the skin than typical dish rags, making them ideal for quick hand drying during meal preparation and clean-up. Garages. Do you have a DIYer living in your home? Stock up on some wholesale hand towels! The tinkerer in your life will appreciate being able to have towels available without having to hunt through the linen closet and possibly dirty other towels in the process. Pool and Spa Areas. Are you lucky enough to have a pool or spa in your backyard? Be sure you have some hand towels and bath towels, too. Add a small storage chest for ultra-convenience, so you'll never be without a towel after you enjoy some working out or relaxation. Entrances. Every time someone enters your home, they track dirt and debris with them. Give them a quick way to clean up by keeping wholesale hand towels near entrance doorways. Pets Appreciate Our Light Blue Hand Towels, Too! Do you have a pet in your life? Bathe them quickly with a soft light blue hand towel. You'll appreciate how soft the towels feel against your skin, too. Wondering how to launder your hand towels? Just toss them in with like colors and use a bleach-free detergent. Then, add a couple of dryer balls for extra fluffiness. Ready to move to a towel you can trust? Get started today by placing your first order with Towel Super Center!